The amount of liquor individuals can bring across a provincial boundary for personal use is set to at least double, following a deal struck at the Council of the Federation meetings in Saint Andrews, N.B. The amount of liquor individuals can bring across a provincial boundary for personal use is set to at least double, following a deal struck at the Council of the Federation meetings late Thursday evening in Saint Andrews, N.B. 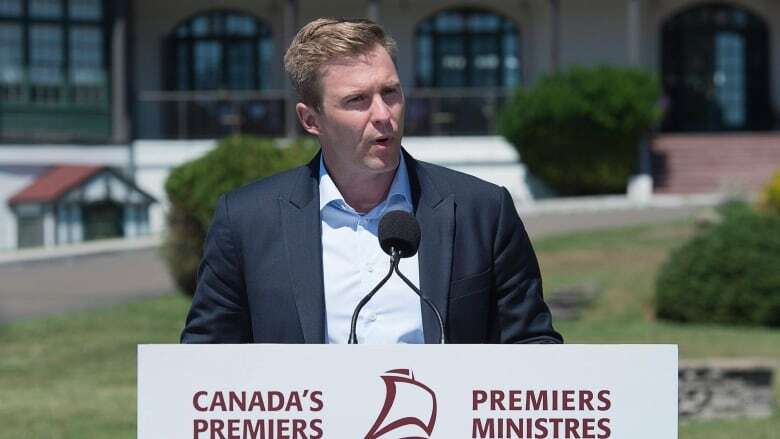 New Brunswick Premier Brian Gallant told reporters that premiers discussed the deal on Friday morning, and had agreed to "significantly increase personal use exemption limits," although the news release subsequently handed out by officials did not specify the size of the increase. "We will be, over the next few weeks and months, clarifying, each and every province and territory, what that will mean for them," he said. "But there is a clear willingness to have a significant increase when it comes to what Canadians are able to import." CBC News was briefed on the agreement by a source speaking on condition of anonymity. The source said that exact numbers were removed from the release at the last minute, based on concerns expressed by territorial governments that felt they had a duty to consult back home before proceeding with any specifics. The fundamentals of the deal worked out the night before still stand. The release left open the possibility that some provinces may go beyond the deal and eliminate their limits entirely. Canada's provinces and territories, which have jurisdiction over the sale of alcohol, formed a working group on alcoholic beverages last year after they were unable to agree on how to liberalize liquor sales before the rest of the text of the Canadian Free Trade Agreement took effect last summer. That working group reported back earlier this month and made seven recommendations, including the doubling of the personal exemption limit that sets how much beer, wine and spirits an individual can transport across a provincial boundary for his or her own consumption. Currently, two provinces, Alberta and Manitoba, have no limits whatsoever. The rest have a confusing array of restrictions and limits. Three jurisdictions — New Brunswick, the Northwest Territories, and Newfoundland and Labrador — have very low limits, making it illegal to cross a provincial boundary with anything but small amounts of liquor. Nine litres of wine (or a standard case). 24.6 litres of beer (or three standard cases of 24). 18 litres of wine (or two cases). 49.2 litres of beer (six standard cases of 24). In the three jurisdictions that have lower exemptions to start, their limits will rise to the level of the other eight provinces and territories, meaning the change is more dramatic for those three. Premiers considered these recommendations during their meetings on economic and trade issues Thursday. But they were unable to reach a deal during the day. New Brunswick Premier Brian Gallant, the chair and host of this year's summer premiers meeting, told reporters late afternoon that a deal was close, but more work remained. That work unfolded through the evening. Sources from at least two provinces have confirmed to CBC News that Yukon and Newfoundland and Labrador were the holdouts. As a province with a very low limit, Newfoundland and Labrador would be making a large shift to sign on to the doubling proposal. In Yukon's case, this negotiation came at a difficult time: the territory is in the process of modernizing its liquor act, and it had significant social responsibility concerns that could be exacerbated by making it easier to bring alcohol into the territory. Some liquor control boards had warned provincial governments of potential lost sales and tax revenue if it becomes easier to shop across provincial and territorial boundaries. Gallant acknowledged there could be revenue impacts, but suggested that raising the limits could also contribute to economic growth, if it becomes easier to sell a province's products in other places. The Canadian wine industry has argued that when wine sales have been liberalized in some provinces, more wine has been sold. It called Friday's announcement a missed opportunity. "It's the 21st century and Canadians are still bound by archaic prohibition era laws that outlaw their ability to join an out-of-province wine club, order wine online, or visit a winery and have their wine purchases delivered to their out-of-province residence," said Dan Paszkowski, the president and CEO of the Canadian Vintners Association. "Canadians would be shocked to learn that they could face significant fines and/or jail time for disobeying these laws." Manitoba, whose premier, Brian Pallister, appeared on CBC News Network Thursday morning holding a can of beer and endorsing change, was insistent that Canada's liquor trade be more free. Pallister wrote to his fellow premiers before the meeting began to lobby for a decision when they met this week. Gallant was also keen to make a breakthrough this week, in order to be able to show tangible progress on an interprovincial trade issue he'd identified as a priority. Although New Brunswick took one of its residents all the way to the Supreme Court to argue in favour of its jurisdiction over setting liquor limits, the current Liberal government is not opposed to liquor sales liberalization per se. Gallant said he has no problem with raising limits, but provincial officials advised proceeding with the court case to defend New Brunswick's jurisdiction to regulate in this area. The working group presented another option to the premiers: eliminating all limits whatsoever, as Manitoba and Alberta have already done voluntarily. But this option was not endorsed by everyone, so the other option of doubling the limits was embraced. The other six recommendations set to be adopted are neither prescriptive nor controversial, and will have fewer practical consequences for consumers. They're a call to "improve information and transparency in pricing and listing practices and enhance e-commerce platforms within local markets," according to the release circulated Friday. "Premiers directed ministers to consider options to increase consumer choice and access to alcoholic beverages, and ensure any proposed changes be done in a socially and fiscally responsible way." The recommendations do not affect online direct-to-consumer sales, the restrictions for which remain unchanged. Some provinces may act in this area in the future, Gallant suggested. This move also does not apply to businesses with commercial liquor licences, which have their own separate sets of rules. In Thursday night's deal, provinces and territories have agreed to amend their necessary legislation or regulations within 18 months, meaning that by 2020 it should be easier for Canadian consumers to browse for booze across interprovincial borders. Occupational health and safety, including different requirements for first aid kits across Canada. Transport regulations, including trucking rules that are barriers to competition and efficient trade. Abbatoir licensing rules, which do not allow provincially inspected meat to cross interprovincial borders. Business registration requirements, which mean companies have to do separate paperwork for each jurisdiction in which they operate. All of these areas have been identified as requiring urgent action ever since the text of the CFTA was released in the spring of 2017. Gallant could not identify anything that had happened on these files in the months since. Two premiers, Manitoba's Brian Pallister and Nova Scotia's Stephen McNeil, have been asked to conclude the work on the alcohol exemption limits and lead future discussions between provincial and territorial trade ministers. Gallant nicknamed them the "twin towers" of the process, because both premiers are very tall. "Donald Trump is wanting to erect a wall between us and our strongest trading partner — and theirs," Pallister said. "These premiers took positive steps in the last couple of days … and we have been working together for months to make sure we take those walls down inside our country." At an event in Markham, Ont., on Friday, Prime Minister Justin Trudeau said: "We very much welcome the movement by provinces on internal trade. While we are signing great trade deals around the world that are great for our citizens, it's really important that within Canada we have the same open trade and partnerships that we get to have elsewhere around the world." As the premiers requested Thursday, Trudeau will host a first ministers meeting this fall focused on trade, something he said was very important to him personally. Newly sworn-in Intergovernmental Affairs Minister Dominic LeBlanc "will lead the charge on this," Trudeau said.